Having cut his teeth on comedy, writer and director Val Guest latterly gravitated towards sci-fi and thrillers. Here he's unable to bring to life a moribund espionage tale, crucially failing to come close to the strong sense of disillusion that characterises Martin Ritt's The Spy Who Came in from the Cold. 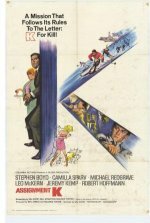 Stephen Boyd gives a charmless performance as a spy working undercover as a toy manufacturer. Slowly he comes to realise that almost everyone he has trusted has deceived him. Camilla Sparv is adequate as his German girlfriend, but even Michael Redgrave, as his loyal lieutenant, and Leo McKern, as his nemesis, contribute little.